Hello hello! Major apologies for being extra AWOL as of late, I've been on a two week trip to Pakistan, but more on that in another post. Welcome to a long awaited review which has been on my blogging to-do list for AGES and I'm kinda relieved I am finally sitting down to write it up! 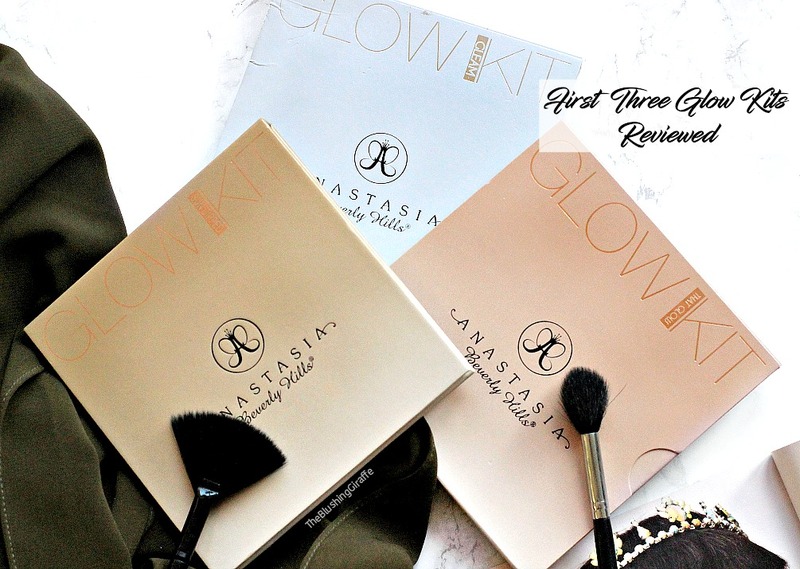 So I'm going to jump straight into it, although I will start by saying that I did not actually buy all three of these gorgeous glow kits and if you want to know how I managed to collect three of them then you can have a read of this post here. Anyways I'm NOT complaining because I love them, each and every one and before I getting into the details of it all - YES these three are totally worth the hype. I can't speak for the others, because I've not tried them (but I DID just treat myself to the Nicole kit cause, well I don't even need to explain myself there do I? Haha. These three are the first to come from ABH, and after sundipped they released moonbeam and sweets - both of which have a little less 'everyday' colours, for me personally but I've heard amazing things about them both! They then released 'ultimate glow', which has to be the only kit I heard bad reviews about, due to the pigmentation issues and high glitter content. So if you read the above post, you will know that this is the palette I got for free (kinda) and one I had no intention of buying. It is also currently discontinued sadly, but I'm hoping that they randomly bring it back like they did with that glow. 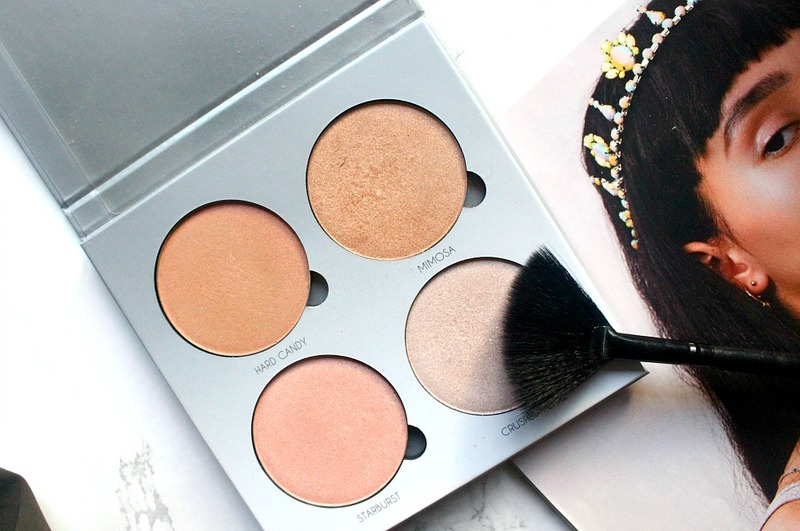 Upon first glance, you might think this palette is best for fair skin-tones, which is what I thought too. However Gleam is the actually the one I pick up joint most, for a day-to-day glow especially. 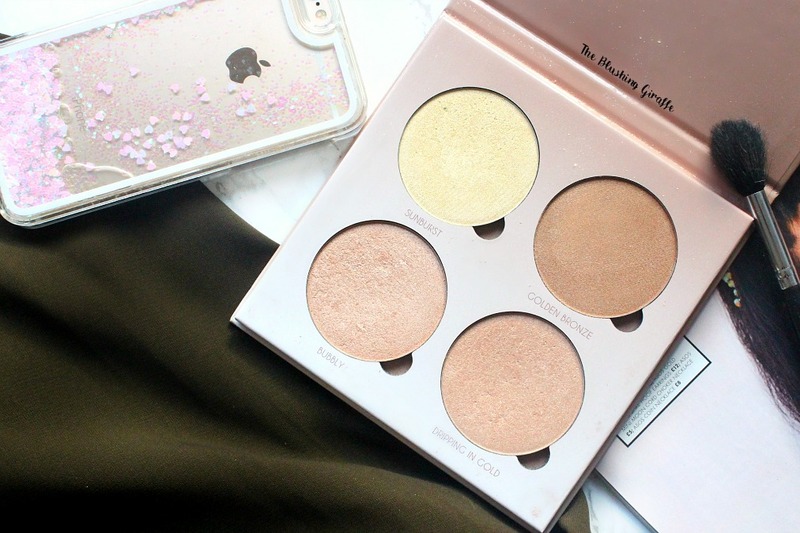 I think you'd love this if: you prefer a lowkey glow, you have ANY skin-tone (except perhaps very deep) and if you're looking for a highlighter kit that is suitable mainly for a subtle glow. Although with a damp brush, you can get a real strobbed look with all of the kits - little tip 🤗. These powders are not super creamy in texture, which I like because it means you can really build them up on the skin, making them versatileThey're also not powdery either - again a big win, since when you tap your brush into the pan, lots of excess product isn't brought to the surface and subsequently wasted. A win-win situation! Hard Candy: By far my least used shade from this quad, hard candy is a true pink highlighter and it works quite well as a blush topper! I find it most wearable when I mix it with the shade starburst and I find it easiest to use when I'm wearing a warmer shade of foundation as it blends in well. 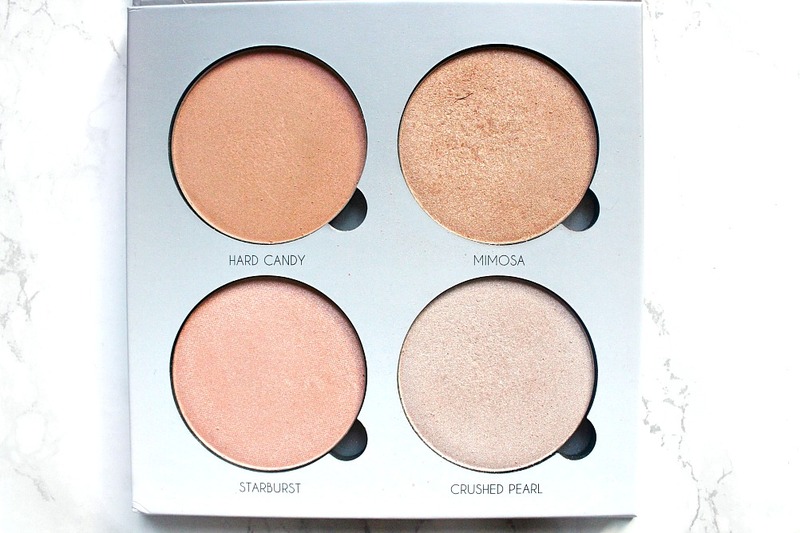 If you like a colourful highlight, you'll like hard candy! Mimosa: MY FAVE! Look at how beautifully warm and golden it is! Mimosa is a shade that when applied with just one layer, looks perfectly fine for day to day, but when layered up I can achieve that stunning brighter look, as you can see in the swatch. It's also one of those stunning shades that on my olive skintone, is not an obvious swipe across my cheek. However as I turn my head it is more noticeable and I LOVE it. Especially when used with a damp brush. DAAAYUM. 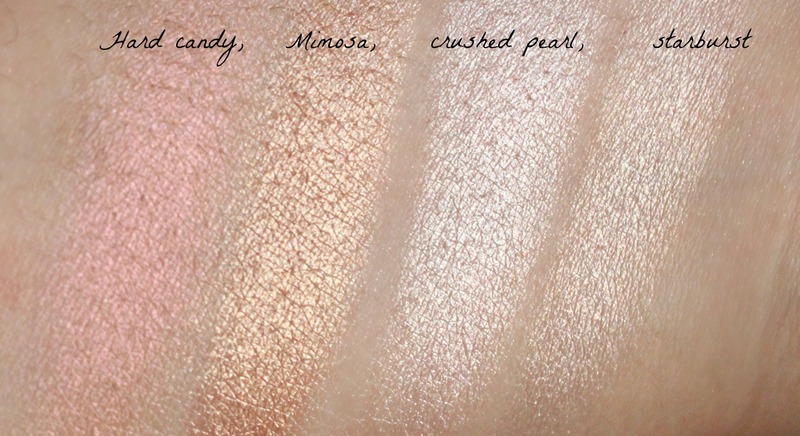 Crushed Pearl: This is my second most used shade, and it is the lightest and brightest. I think the name is perfect, as it is almost like Anastasia literally crushed up some pearls and pressed it in the palette! I tent to pop this on the very top of my cheekbone for a super bright highlight, or I'll use it on a thicker fan brush very lightly so it is distributed in a softer way. I prefer this when I'm not tanned or wearing a warmer foundation because it is more on the cool toned side of things. Starburst: I know I just said C.P is my second most used shade, but starburst is coming in at a close second! It is one of the most wearable cooler toned highlighters I own. It is a slightly diluted silver, when compared to crushed pearl, but it is still pretty stark against my olive skintone. However with a soft brush starburst works very well. I love that there is no glitter in any of these pans, and it applies onto the skin so perfectly, with a small tap going a long way. If you have a light skintone and choose to pick up this palette I'm sure this one will become your go-to! Moving onto that glow, this is the kit I originally wanted and I can tell you it was certainly worth the wait! It's also the one I go to on a daily basis, since it contains very wearable shades for my olive skintone. Again the formula of all of these is the same as the gleam kit, with no glitter and a good balance between creamy and baked! I think you'd love this if: you have any skintone, but you prefer your highlight to be on the warmer side of things, then you need this in your life. Also if you're looking for a kit that you can wear on a daily basis to work and basically nothing too out there - pick up that glow. I won't repeat myself too much, because I've pretty much reviewed the whole concept of these above, but oh my goodness can we just take a moment to appreciate how gorgeous that glow is?? 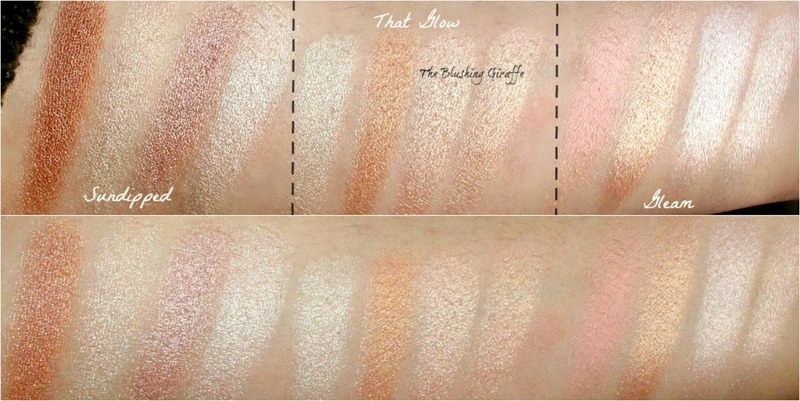 I will say though that the bottom two shades are VERY close and you'll see in the swatches below what I mean. I'm not complaining cause I use them a lot and its still such good value for money! However if similar shades irk you, or you're looking for a more unique palette, this one may not be the one for you. Sunburst: By far the most yellow toned gold highlighter I own! It is very bright and in ya face, and because of this I haven't gotten the most use out of it. However, in this quad, this is like the OTT shade that you use when you want a really obvious glow. Or you could use this one, in a similar way to crushed pearl, as that real WOW pop. Golden bronze: A shade that is stunning on deeper skin-tones, but for my olive skintone, its not the most highlighty shade. However it is workable and I've used it a couple of times over my bronzer with a lighter hand than I would when usually highlighting. I'm glad they included it in the quad, because I'm sure it looks gorgeous on so many deeper skintones! Bubbly: A beautiful champagne-esque shade, which I use so often. It's perfect for everyday, can be used lightly or built up and theres not much more to say - a real winner. Dripping in gold: Is very similar to bubbly, however it has a splash of gold as the name suggests, and again I ADORE this highlighter. Especially when I'm a little more on the tanned side, because it is just so stunning. I tend to apply this with a slightly damp brush and if I could purchase these highlight shades individually (which I do hope she eventually starts doing! ), I'd have a couple of back ups of these 🙌🏽. 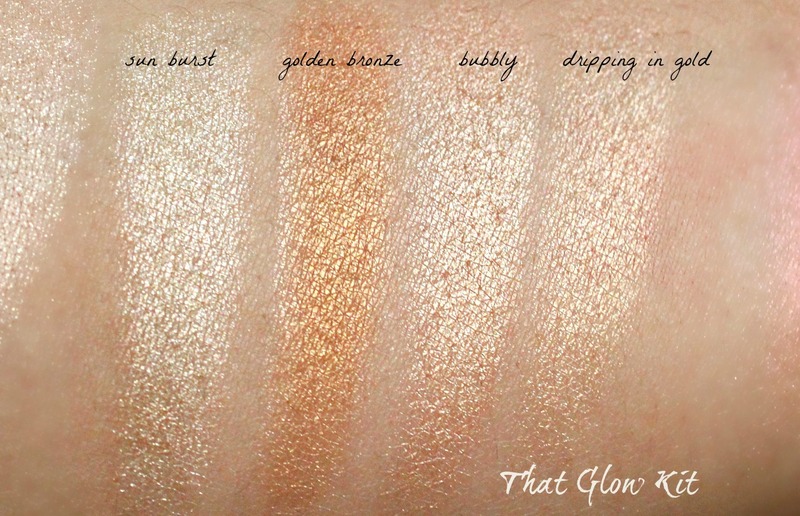 And finally the last glow kit I'll be reviewing today, I present to you sundipped! Also £40 with the exact same amount of product as the other four - which is such a good deal in my opinion (as long as you're a regular highlight wearer though haha.) 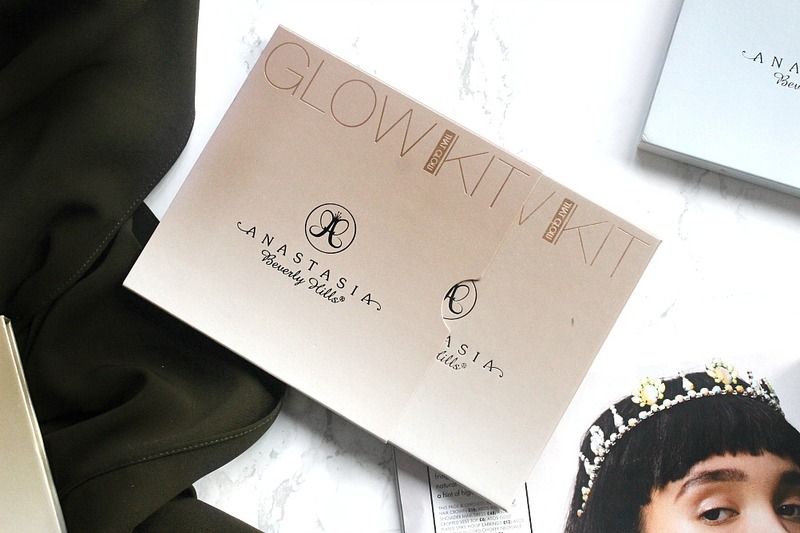 This is probably my second most used glow kit thusfar, and it packs a little more of a punch in the pigmentation department. I thought I'd just show you the sleeve that they all come in though, because I am recycling these ASAP haha. They're good for when you travel, but I use these so much that it's just a little annoying step lol. I think you'd love this if: You have a medium-deep skintone, since these shades are definitely stronger than those of the first two kits. 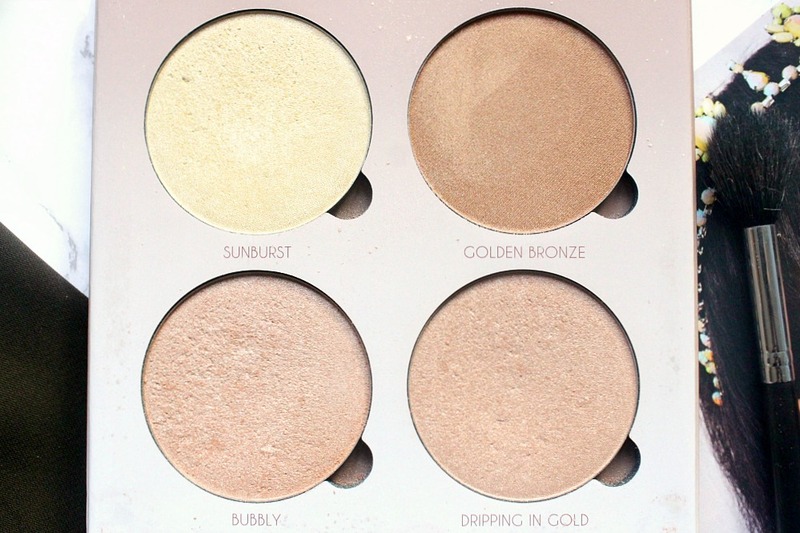 Also if you don't want too many golden shades, but you're still looking for a mostly warm toned highlighting palette, then sundipped is your best bet. Before I get into each shade, I want to apologise for the lack of close up swatches for this kit, I have no idea why I didn't take one but anyway you can still clearly see the difference between each shade and I'll be reviewing them in order. Bronzed: The deepest shade from the three kits, and as you may be able to guess one of my least used ones too. However it is perfection for anyone with deeper skin, and actually it looks pretty fantastic on top of bronzer, as look as you apply it gently because like I said - this kits' pigmentation is stepped up a notch! When I'm going for a really glowy look I whip out a bit of bronzed, and also it makes a gorgeous all over the lid shade too. Summer: For some reason it has swatched pretty badly, but on the skin it looks much much better. Summer is naturally my go-to shade in this palette because its a lovely golden shade and I think it's been named perfectly. It does remind me of summer and it gives me a beautiful glow too! Tourmaline: Is probably one of the more unusual shades in my highlighter collection, but I love it. Tourmaline is also very difficult to describe, I suppose it could be called a rusty bronze with a dash of cool tone to it?? I might just let the swatch do the talking here! But its a shade that would look lovely on deeper skintones, I personally like to mix it with moonstone to make it more wearable on my olive skintone, but it could work as more of a subtle highlight alone too. Moonstone: The lightest shade of this quad, moonstone is a beautifully bright without actually being unwearable. I suppose this is the 'pop' shade of the quad, but again I could definitely wear it alone when used with a light hand. I also tend to use moonstone as a mixer shade, because it makes any darker colour more wearable. And here are the three kits swatches side by side, with every single shade being different...even if some are very close! I hope this post helped you to figure out which one (two or three!) that you wanted, as you can see you don't really need all three but I do use all of them and love them all for their own reasons. 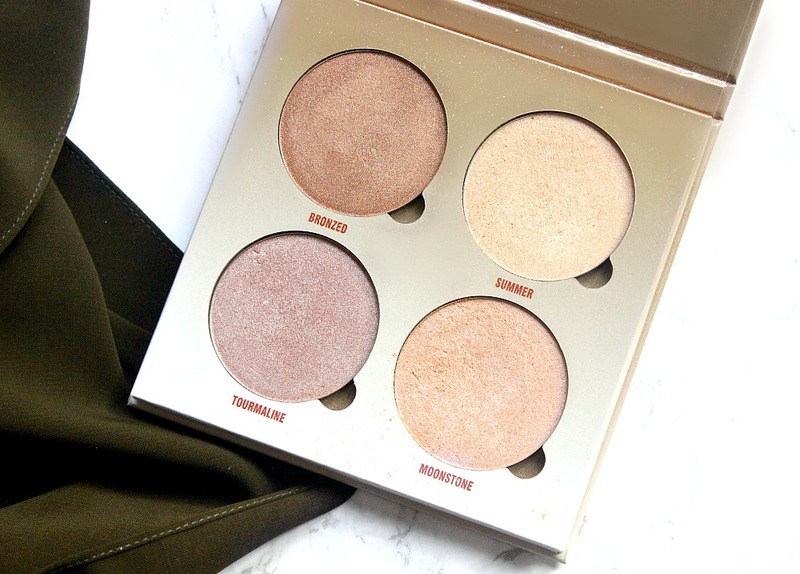 I've been asked so many times, which one I would recommend, so if you are olive toned, then I'd have to say that glow, because it is soooo wearable. However if you have deeper skintone, sundipped is the one for you, the range of shades is excellent and they're all so blendable and easy to mix, you'll be set to glow! Without flash at the top and with at the bottom! I know there are quite a few newer kits out there now and the glow is currently sold out, but I'm sure it's in the process of being restocked, since its a best seller and this has happened before. Also these are three of the kits where you can actually remove the pans, and the fourth is 'sweets'. The newer kits aren't removeable which is kinda sad, so I hope she makes all of these shades available individually because there are quite a few of these shades that I absolutely LOVE, and although I'm in no danger of running out of highlight anytime soon, it would be cool to be able to get just those ones!